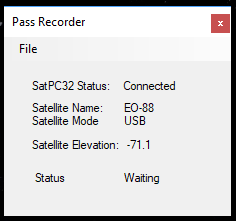 Those which follow me on social media might have noticed at the start of the month I launched a small desktop application called Pass Recorder, it was built purely as I wanted a tool to sit in the background when I was operating on satellite passes recording what I was hearing in case I needed to double check a callsign or share the audio with a friend. Pass Recorder interfaces with SatPC32 via its DDE interface and automatically records a pass if its above 0 degrees to a high-quality wav format, this audio quality does, however, generate slightly larger files with an average pass being about 60mb, but AO-7 passes are more in the range of a 100mb. However, for a proof of concept it’s working well and I’m planning to make some improvements and allow dropping the audio quality which will reduce the size for those who want that, I’ve also had some requests to support other applications, which I have no objection to, the next supported application will be WXTrack by David, GM8ARV. You can grab the application by going to https://www.2m0sql.com/pass-recorder/ the tool is free but donations are appreciated.